1. Without the darkness, we would not appreciate the light. We need light to cast a shadow. Some of our most profound pain points in life can help us better appreciate the pleasure we experience and not take it for granted. This knowledge doesn’t always feel relevant or helpful when we’re in the thick of our growing pains, but it can help provide perspective. 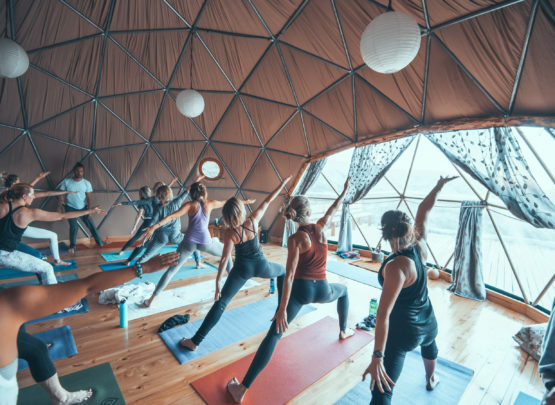 Our Iceland Yoga Retreat to The Midnight Sun is an amazing way to explore the stark differences between light and dark as it shows up in nature and your practice. If Canada is more your speed, our campfires on starry nights at Bodega Ridge will be a beautiful example of the juxtaposition of light and dark. 2. Use your growth as a teacher. Empathy is a major driving force in deep, meaningful connection with others. As you navigate your growing pains, your friends and family will hopefully be there to support you. They will also be there watching you as you grow and likely be inspired by your strength and stamina during times of struggle. These same individuals may come to you during their times of need and you will have a real life experience to draw from as you help and support them along the way. Our Scotland retreat will be led by Kate Mulheron, who fully understands these many layers of growth. Writing is another powerful way to learn more about the teachings contained in your growing pains. We’ll be heading to the Redwoods of California with Kimber Simpkins to learn how to use yoga and writing as a form of personal creativity and expression. 3. Witness your own strength. You are stronger than you think and there is no better time to witness your own strength than when you are being tested by life’s challenges, whether they be physical, emotional or mental. There is a profound sense of pride that accompanies the process of working through growing pains. One of life’s great honors is to be able to look at who you were before and who you are now. Building and experiencing your own strength is a given on our trips to Patagonia and Calistoga.